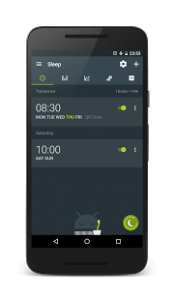 Sleep as Android : Smart alarm clock with sleep cycle tracking. Wakes you gently in optimal moment for pleasant mornings. More features waiting for you to explore! Great sleep monitoring app Very useful. I use it every sleep. Nice design. The smart wake up is awesome! Updates and improves frequently. I can’t set an alarm from my Huawei Watch to my Nexus 5 phone via the app. When I try to set an alarm from the watch it only let me do it on the build in OS alarm clock app. No option to choose Sleep as Android as the default app for alarms on Android Wear app. Sent a mail to support about it with screenshots. Thanks for the reply, hope things will change this fall on Android Wear 2.0. I see, unfortunately from Android Wear there is no way for 3rd parties to register for new alarms.. this is by design and i don’t know of an workaround..